Watch the funny cop video. Just goes to show you that even people that should know better often don't. Listen to the officer say, "this gun isn't loaded", handle it in front of a bunch of schoolchildren, and then proceed to practically blow his fingers off and lodges a .40 caliber bullet in his leg. 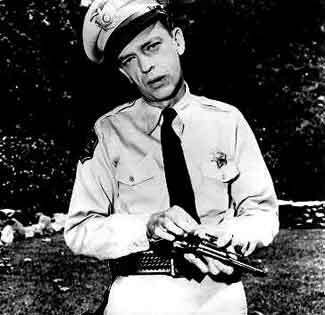 For some reason, even after the cop shoots himself in the leg he still wants to talk gun safety! What an incredible accident, but surely one that could be avoided. Many people are swayed to the Glock line because of their hammerless design. Well, their entire design is pretty slick, and people probably buy them for that reason as well. There is no saftey on a Glock from what I understand. Instead there are two triggers, which keeps the gun from discharging. Ha! That police officer will probably be looking for a new gun soon. That and some first aid. This video goes hand in hand with the lion hunt video, which shows more people on a vacation that don't understand the notion of firing at exotic wild game, not at each other.